Mobile may be the most singularly important concept when it comes to internet marketing. While everything is important mobile web design may be the most important area of focus for the next few years. Ultimately everyone will have a smartphone or tablet and will be using it to search for everything. It’s already happened and most of us are playing catch up. Mobile Design. The buzzword over the past few years has been “responsive design”. Responsive design is a concept that the website responds to whatever device it’s on. So from a desktop to an iPhone there are 100 devices in between and a responsive site would normally resize itself based on the size the screen size or browser. Truth be told, this concept works but in many cases, not well enough. Today’s websites are built backward. Responsive desktop sites have to be modified at the end of the project to make sure the mobile site renders perfectly. We still tend to work backward as well, but we’ve started to change. The mobile experience is so important that we’ve started building the mobile simultaneously with our web design as opposed to being done last. Mobile e-commerce transactions have exploded in the past 5 years breaking records each year. This is just more evidence that mobile website design is critical. Ease of Use. When you find a site using your mobile phone – the mobile sites generally offer a modified menu so you can search faster and find what you are looking for. The resulting pages reveal the ease of use of the site. Most developers focus on the menu but fail to modify the pages, content and or eCommerce to ensure a great user experience. The basic concept is that just because you are using a small device doesn’t mean the user experience can’t be better than a desktop. This is what we focus on when building a mobile website design. Speed. 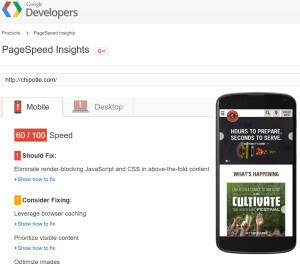 Google recently launched some new initiatives to increase the speed of mobile sites. The faster your mobile website is the better your performance will be as it relates to internet marketing. Today, most mobile sites are dismally slow. The ruins the user experience and Google is tracking your performance. A slow site is treated negatively by Google and may hurt page search engine ranking. We offer many techniques to speed up your mobile site from custom code, plugins, server optimization etc. It’s what we do.